By the time Pearl Harbor was attacked, many Americans knew it was only a matter of time before the United States were drawn into the War. When the war began, the only services with pilots were the Navy and the Air Force, which then existed as the Army Air Corps. Pilots were officers in all services, and officers were, at the war’s outset, required to be college graduates. Also, the cramped cockpits of the relatively small fighter planes of the day would not accommodate men taller than six feet. In classic military logic, since no recruit could be guaranteed not to be ordered into a fighter squadron, no tall men could fly, despite the fact that the cargo planes and heavy bombers had plenty of cockpit room. Thus, Wes Hutchinson, a simple high school senior from Kansas, joined the Air Corps as a Flight Engineer, an enlisted position that gave him joint responsibility for the airplane while in flight, along with the pilots. While they focused on ensuring the plane followed the course laid out by the navigator and radio operator, the flight engineer’s job was to see after the myriad mechanical details of keeping the airplane in the best possible condition. It was a technical, engrossing job that rewarded competence and highlighted ineptitude even before the airplane took damage: engine power, propeller speed, and fuel/air mixture settings were in constant need of adjustment, fuel and oxygen supplies were spread among multiple tanks, finicky generators and first-generation electrical components demanded finesse to work correctly, and dozens of other systems and components that are now virtually maintenance-free or controlled by computer then comprised a technical, never-ending version of “Whack-a-Mole” for one man, the Flight Engineer. 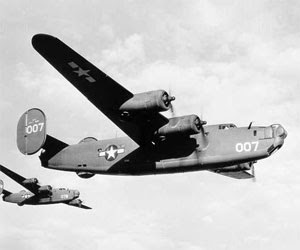 American heavy bombers like the B-24 carried a crew of nine: two pilots, a bombardier, navigator, radio operator, flight engineer, two waist gunners, and a tail gunner. When under attack by enemy fighters, the flight engineer had to leave his console to man a machine gun turret in the top of the fuselage behind the cockpit; at such times, damage control had to wait. If the ship survived the attack, an engineer would have to piece together what had happened and figure out the best way to continue. It was no job for an idiot, prima donna, or hothead. The engineer’s, bombardier’s, tail and waist gunners’ fields of fire combined made attack on an intact formation of bombers a formidable and dangerous challenge for enemy fighters. But if a bomber could be damaged and forced out of formation, it became an easy target, like a lone sheep separated from the herd. Such airplanes rarely made it back, and their crews faced the Hobbson’s choice of staying with their plane and fighting on, often wounded at least as badly as their ships, or jumping out of them and almost assuredly being taken prisoner, if not worse. Wes Hutchinson was a member of the storied 93rd Heavy Bombardment Group, known for its itchy feet and English (mis)spelling as “Ted’s Travelling Circus.” The Circus was based in Alconbury and Hardwick, England, but was detached several times to fly from bases in other countries, most notably from a primitive one they scraped up from the barren sands of Benghazi, Libya in 1943, and to which they returned later that year. One purpose of their detachment to Libya was to bomb Sicily in advance of the invasion of Patton’s 1st Infantry Division, of which Frank Lawton took part. Following those relatively textbook missions conducted from high altitudes, however, the men began to fly training missions in which they rarely climbed higher than a few thousand feet. Flight at such low altitudes is inherently more dangerous; navigation is difficult at best, and often impossible because the view is so limited. The men of Ted’s Travelling Circus didn’t know they were training for a mission so important, and so costly, that Air Corps Commanding General Ira Eaker considered 50% casualties both likely and justifiable. The target was what Winston Churchill rightfully termed “the taproot of German might,” the oil refining capital of the Third Reich, Ploesti (pronounced plo-YESH-t), Romania. Eaker’s casualty estimates proved correct, but critical contingency planning and navigational errors combined to cause two of the three bomber groups participating in the raid to approach the target from two different directions simultaneously, creating utter havoc over the target. This and a vastly underestimated anti-aircraft defense saved the target from the destruction that could have justified the raid’s sickening human toll. Several Medals of Honor were awarded, most of them posthumously, but the refineries were back at full production only weeks after the raid. On their return to England, the men of the 93rd enjoyed a relatively slow winter, thanks to the dismal winter weather over northwestern Europe. By spring, however, with fuel and ordnance supplies threatening to crowd the men off their bases, the Allied Command began ’round-the-clock bombardment of Germany. The punishing campaign reached its zenith late in March, 1944, in what became known as “Big Week,” during which the American 8th Air Force alone dropped over 10,000 tons of bombs. Wes Hutchinson, having survived both Ploesti and Big Week, was nearing his crucial twenty-fifth combat mission, at which point his combat tour of duty would have ended, when his luck ran out.